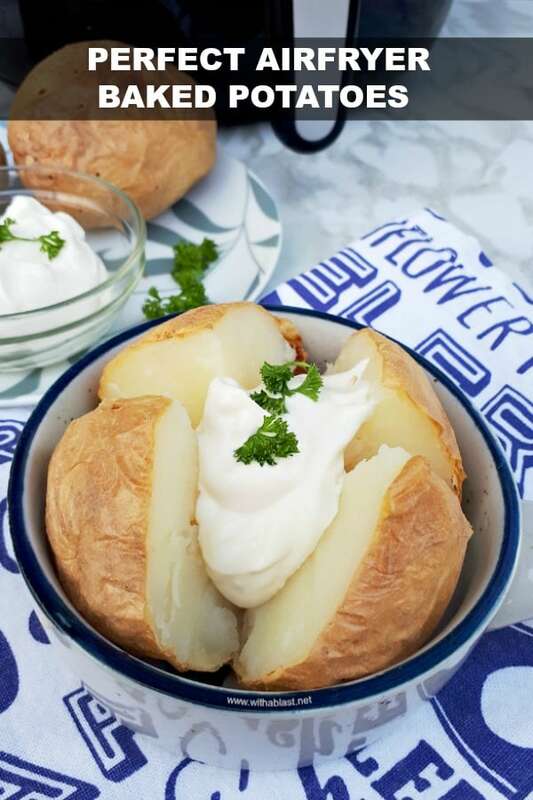 Perfect AirFryer Baked Potatoes are just that – perfect ! Soft on the inside, with the skin crunchy and a must have side for so many main dishes ! There are some things I just can not do ! Like playing pool / snooker – nope, can’t hit that ball if my life depended on it. We had a large table, for years, and I tried, but gave up. Something else, which might come natural to you, is to bake a jacket potato in the oven ! Really, I have tried many times over the years. Adjusted this and that, but the baked potatoes always ended up, well, just about inedible ! Either way overdone and burnt, or still raw on the inside. So I usually get my craving satisfied for a baked potato at restaurants. With whatever main meal I order, which is normally some type of steak. Nowadays, it seems even the restaurants have started taking corners, or they might have a cook like me. Such a simple dish to make, and made by millions of people every day ! But, no it seems I am lacking that particular gene – to bake a potato the way I like it. Since I received my AirFryer as a birthday gift last year, I am “baking” up a storm of baked potatoes ! 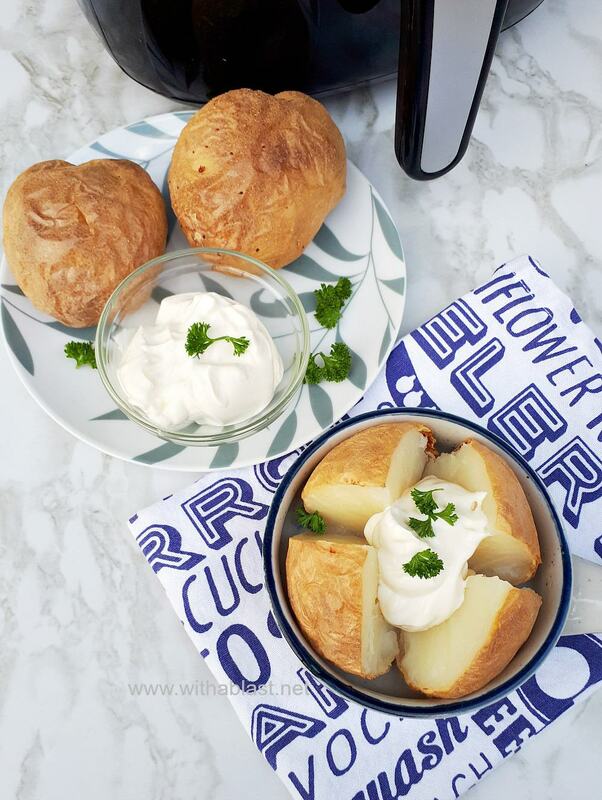 And finally I have perfect AirFryer Baked Potatoes which I can enjoy at home. I have the smaller type of AirFryer, but have cooked 6 medium sized potatoes at once, three or four times already. Larger potatoes, well, I can only get four done at once, which is more than enough for us, seeing as it is usually no more than three of us home for dinner. 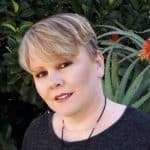 This post is not really a recipe post, but more of a tutorial (for lack of a better word) to bake potatoes in an AirFryer. No fancies about them, just the basics. After scrubbing the potatoes, I have pricked the skins a few times with a fork, and lately I just throw them in the AirFryer, no pricking. Same result both ways. If need be arrange three or four potatoes on the bottom of the wire basket and place the rest on top. Halfway through turn over the potatoes and leave it to finish cooking. My favorite – sour cream ! and do not forget the basics – Salt and Pepper ! 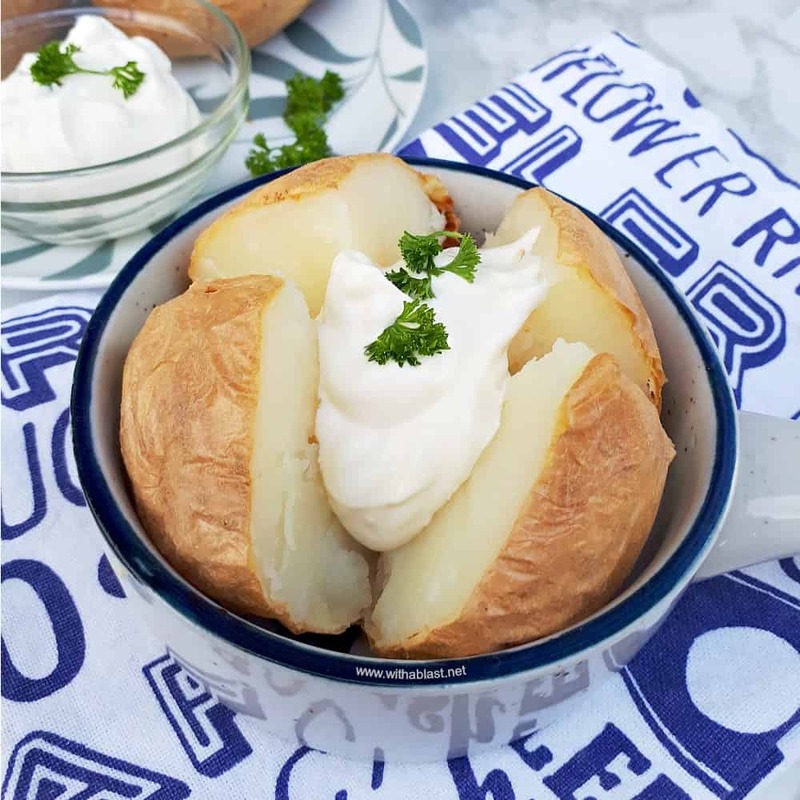 Perfect AirFryer Baked Potatoes are just that - perfect ! Soft on the inside, with the skin crunchy and a must have side for so many main dishes ! 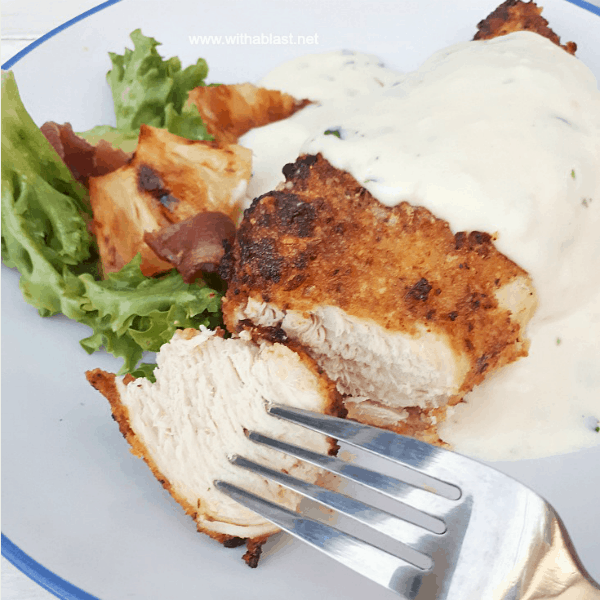 Here is another recipe where you can use your AirFryer ! You’ve given me LOADS of inspiration here. I have an air fryer that I use mostly to make “fries” with but haven’t thought about doing a baked potato in there ……yet!! 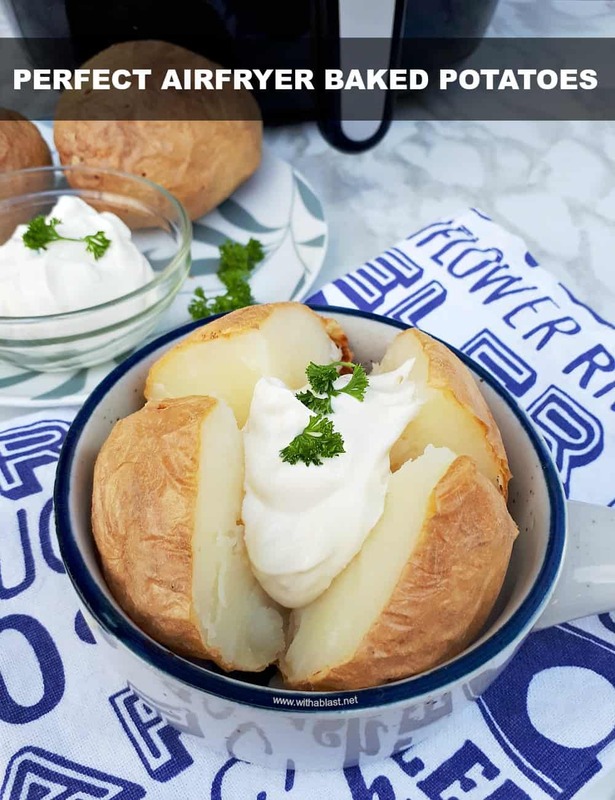 Baked potatoes are such a lovely comfort food, this sounds like a great method! I’ve been wondering about whether or not I need an air fryer. I think you’ve convinced me! I also have trouble baking potatoes! Have you tried sweet potatoes in it? 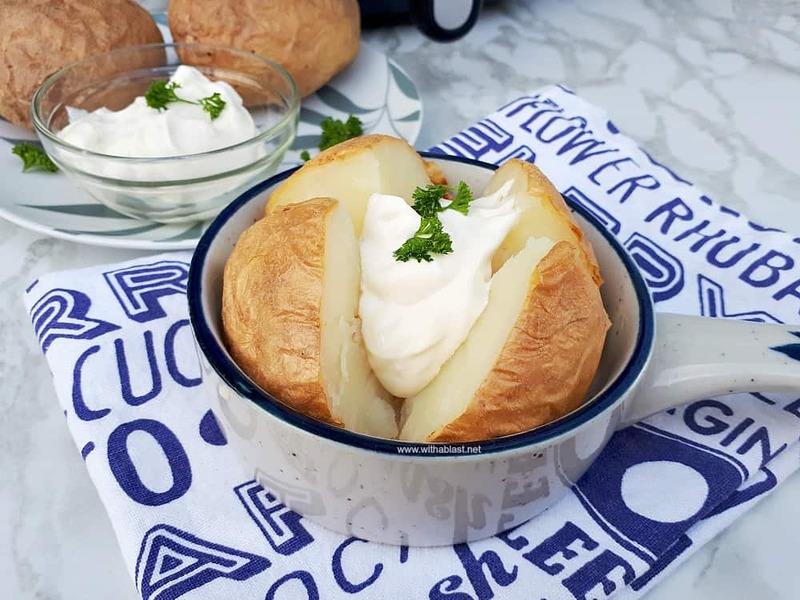 Air Frying is such a great way to do a baked potato! Especially as it won’t heat up the house on hot days like an oven does. Such a great comfort food meal – perfect for these winter days! 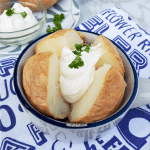 I love the idea of making a baked potato in an airfryer! I have to try this! I keep saying I need to buy an air fryer, now I REALLY need to get one. Those potatoes look so good and easy to make!